The Tugger Ground Stick from All for Paws is an elastic tugging toy for your dog. 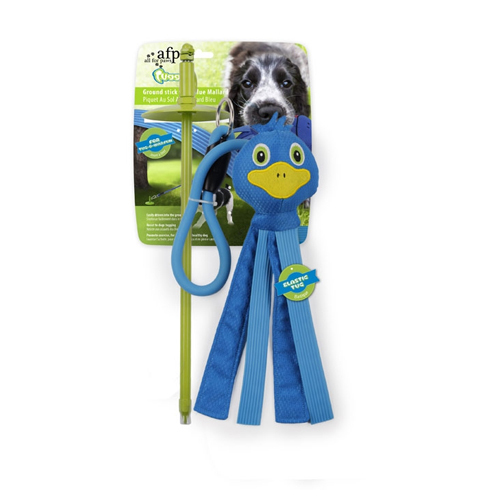 The blue toy duck and the elastic are attached to a sturdy stick that you can plant into the ground. The Ground Stick can provide your dog with hours of entertainment. Nothing is more fun than playing with your dog, whether it's outside in the garden, or in the forest with a ball, rope or frisbee. Playing together is important for a good dog-owner relationship and it is a great physical exertion. Even when your dog plays by himself, you want him to have a good time. With the Tugger Ground Stick from All for Paws, this is no problem. This tugging toy has a stick and an elastic with a blue toy duck dangling from it. You can plant the stick into the soil, allowing the dog to chase the toy. The elastic makes tugging even more fun. 72 x 13.5 x 6cm. The mallard is approximately 35cm long. Have you used AFP Tugger Ground Stick with Blue Mallard before? Let us know what you think about this product.